Marinade the chicken with lemon juice and salt for at least 1 hour. 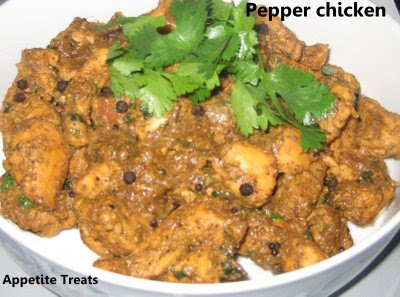 Dry roast pepper, cinnamon, bay leaves, cardamom, coriander,cloves,garlic,ginger and grind them into a coarse powder. Heat oil in a pan , saute onions till they are transparent.Add in green chillies ,chicken and saute for another 2 minutes. Add in ground masala powder and salt and mix well. let cook covered for 20 minutes, till the chicken is tender .